Machinery and cranes tower over the construction site of the Panama Canal's expansion project, Cocoli, Panama City, Feb. 5, 2014 (AP photo by Arnulfo Franco). 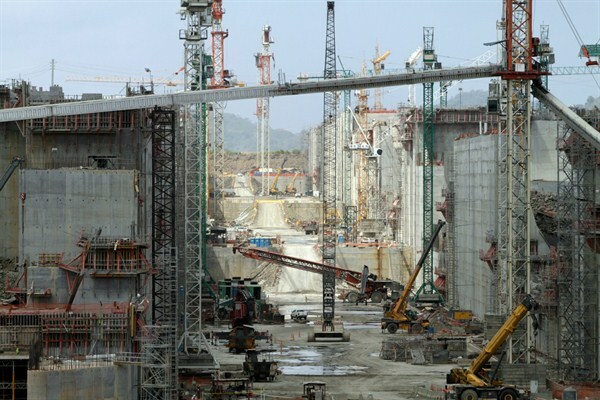 The $5.25 billion expansion of the Panama Canal, which officially opened in late June, tripling the size of vessels the canal can accommodate, is about more than just bigger ships. Unlike in 1914 when the opening of the canal made unimaginable trade routes possible, boosting the economies of the United States and many others, the expanded canal may have the biggest impact on Panama’s own economy. But the potential rewards also come with major risks.